We are very pleased to announce that we have hit a very important milestone in our service to the International Web Community by providing our 3,000th identification. This was reached on 30 December 2017. We would like to thank all international contributors who have sent us their enquiries, and we would especially like to thank our team of SVVS experts, our external experts and also the many international experts who have provided identifications in last 17 years. Well Done!! Another lovely photo received from Tom Cosens from Yorkshire (UK) of an old car he didn't recognise. This is from his collection of postcard curiosities on which he has no other background but which are needing identification. -- De Dion Bouton controls on the steering wheel. Unusual corrugations to the sides of the seat/engine cover which did not help me but were very obvious to our Ariejan Bos who advised this is Birmingham made c1902 Alldays & Onions 4HP Traveller Voiturette. Puzzling photo found on the website of one of our plate contributors (UK) where it is notated as a 1905 Military Post Bus on a route Novi to Petrovac in Bosnia. Can we identify vehicle? -- Interesting machine from the 1901 Austrian Distributor of Daimler vehicles. Started own cars 1902 when joined by Paul Daimler and succeeded by Ferdinand Porsche. 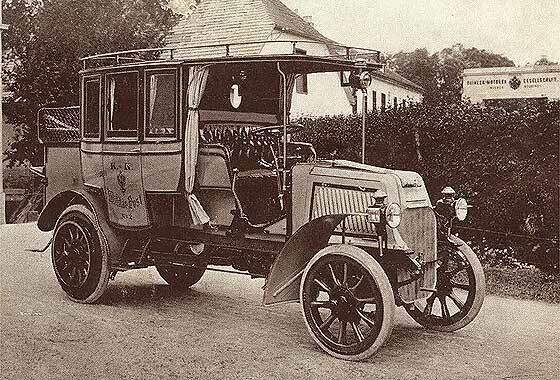 Our Ariejan Bos advises this is a cca 1905 Daimler Post Bus via Austro Daimler. Old-fashioned bonnet used until 1906. A rare photo! Another interesting period photo which was a glass negative from Alun Pugh of Leeds (UK) " Can you identify this fine chauffeur driven open top for me please?" -- Badly moire patterned photo which we have much improved. No registration visible so no aid to dating. Looks early but is British and built just off Picadilly Circus London by the City and Suburban Electric Carriage Co. Made one for Prince of Wales. 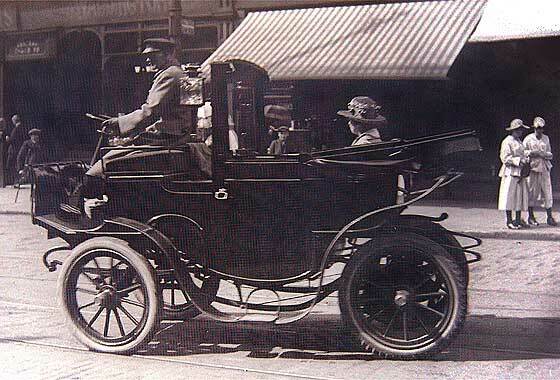 This one is a cca 1906 Alexandra Three-Seated Electric Carriage, with Co chauffeur. 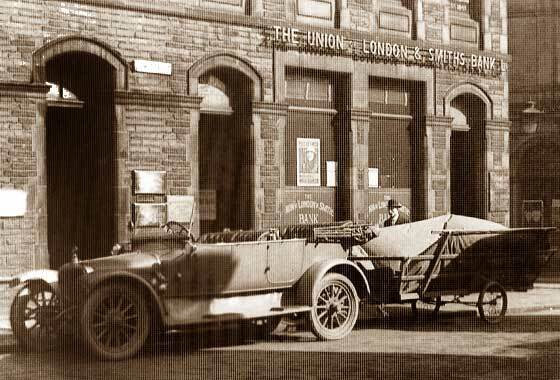 Another lovely photo received from Tom Cosens from Yorkshire (UK) of an old vehicle he didn't recognise. This is from his collection of postcard curiosities on which he has no other background but which are needing identification. 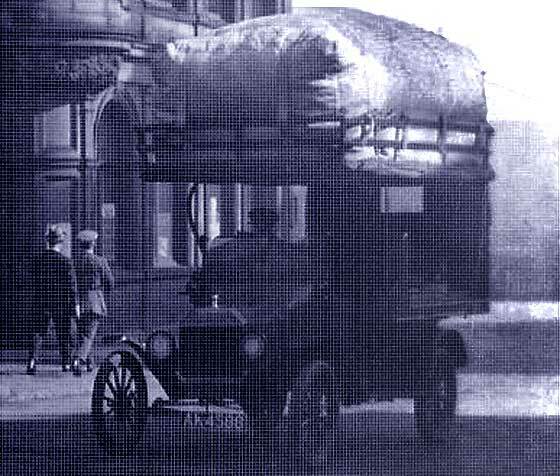 -- Part photo of what seems to be an early lorry. No registration is visible so not much help in dating or location. Radiator similar to Albion and Commer but this one is taller than the bonnet suggesting this is a Basingstoke built cca 1909 Thornycroft 2 Ton Lorry. Another puzzling photo received from Mark Dawber (New Zealand) from period New Zealand paper advising of a holdup/murder of driver of an unspecified car. This is photo of another car in same spot. Recently identified as Stoneleigh. 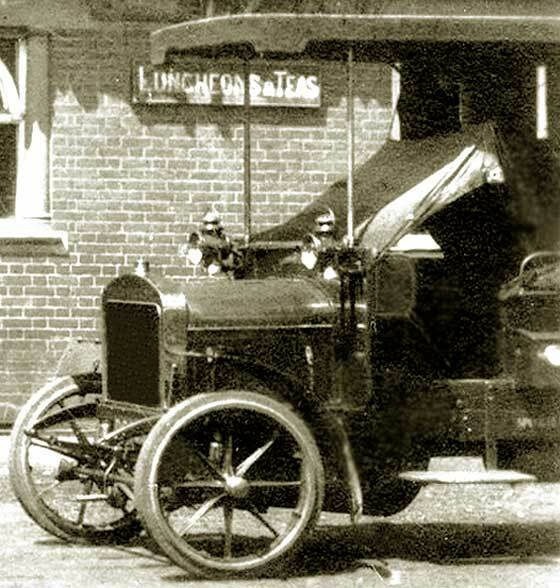 -- Our doubts that it was a Stoneleigh but one of our wise sages confirmed that the Deasey Motor Car Manufacturing Co made a cca 1912 Stoneleigh 13.9 Light Four-seater car with a Knight Sleeve Valve Engine. Name re-appeared 1921 on 9hp V 998 twin utility. Another interesting period photo which was a glass negative from Alun Pugh of Leeds (UK) " Can you possibly ID this road roller with a Leeds plate?" -- Badly moire patterned photo which we have tried to improve. Registration U 1939 was issued by Leeds County Borough Council in mid 1912. 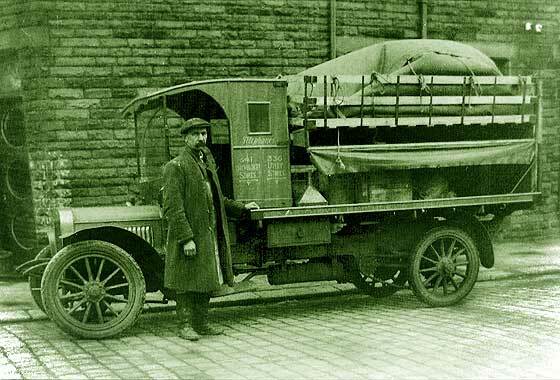 On this page we have the smaller brother; this is Leeds made cca 1912 Mann 35HP Steam Road Tractor probably used as a 'gully cleaning wagon'. 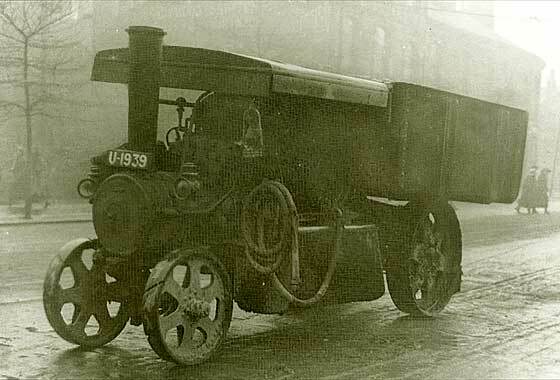 Seems many of Mann's traction engines were Leeds registered. Another interesting period photo which was a glass negative from Alun Pugh of Leeds (UK) " Unusual road roller/traction engine...and number plate..C-DE-1. Can you ID please? -- Registration indeed strange, as is the vehicle. Looks to be a small steam roller pulling a liquids trailer. 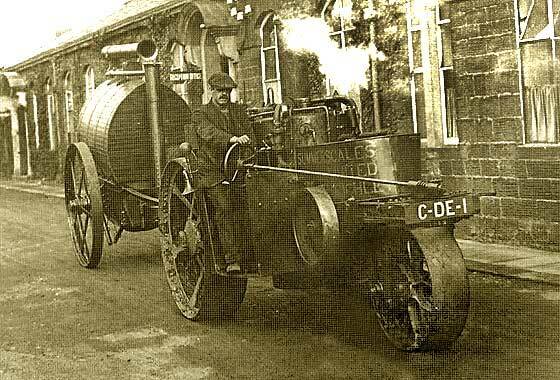 Likely local, so lots of research suggests this could be a Leeds built cca 1913 Mann Lightweight Patching Roller with a tar spraying trailer which seems to have its own burner. Co bought by Atkinson, later Scammell. Another interesting period photo which was a glass negative from Alun Pugh of Leeds (UK) " Marked Bow Street, Keighley. Can you identify vehicle please?" -- Badly moire patterned photo which we have tried to improve. No registration visible to aid dating, but fuzzy radiator and front suggested Sunbeam. It seems the car is pulling a gas bag in a light trailer. 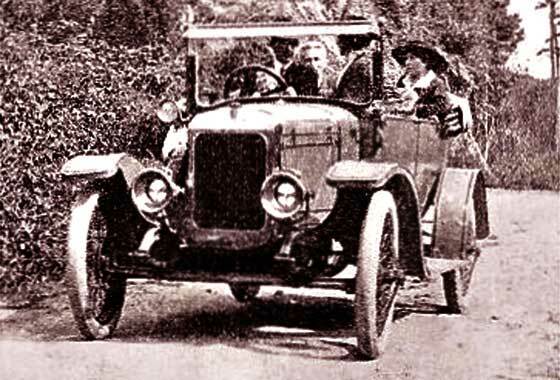 Confirmed by John Warburton and Bruce Dowell that this is a cca 1913 Sunbeam 12'16 Tourer and the photo would be in 1916-18 period. Another interesting period photo which was a glass negative from Alun Pugh of Leeds (UK) " Can you possibly identify this farmers car with interesting load? Sheep car!! -- Not a clear photo but as a sheep farmer I am relatively sure the sheep is a calf! No registration is visible so not much help in dating or location. The car is French, represented in UK by Renault Freres since 1904. 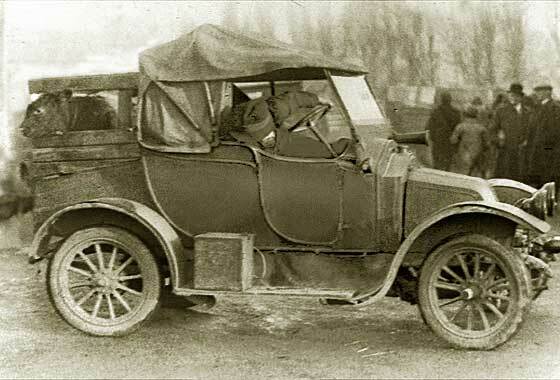 Small car seems later modified, a cca 1913 Renault AX Two-Seater, two cylinder, 1060cc, and a cow in dickey seat. Another interesting period photo which was a glass negative from Alun Pugh of Leeds (UK) " Another from my glass negative collection. There is a sticker on the windscreen 'NMV,Keighley'. Can you ID please? -- No Registration is visible so not much help in dating or location. No immediate help from the "NMV, Keighley" sign either. Car is fortunately bit easier, not French but Scottish. 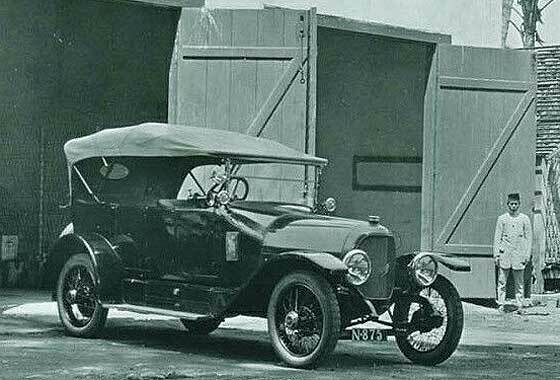 Dating from header tank says this is a pretty coachbuilt cca 1914 Arrol Johnston 15.9 Landaulette Roadster. Another interesting period photo which was a glass negative from Alun Pugh of Leeds (UK) " Marked Bow Street, Keighley. Can you identify vehicle please?" -- Badly moire patterned photo which we have tried to improve. Registration seems to be AK 4566 which is a Bradford County Borough Council issue but accurate dating details not available. The Gas Powered truck is American and from angled radiator but stubby scuttle we can relatively accurately date it to a cca 1915 Ford Model T Pickup. Another interesting period photo which was a glass negative from Alun Pugh of Leeds (UK) " Reg plate letters smudged, number is 852 and could be BU [Oldham]. Ashton under Lynne on truck and Knapes Gas Burnley on the gas bag. Can you identify?" -- Badly moire patterned photo so not been able provide a definitive identification. Lights/wheels suggest American with pointed rad. Suggestion, possibly cca 1916 Jeffrey Van. Another Suggestion: Willys-Overland, 1918 Model 90. Another puzzling photo received from Mark Dawber (New Zealand) questioning the make of the car. Is it maybe '20s Panhard?? - or Th. Schneider?? -- No, it is from the Netherlands. Made in Amsterdam by a company started in 1880, made royal Golden Coach 1898, cars by 1903, second in Peking to Paris 1907. Aircraft in WW1, so introduced the C1 Aerocoque in 1919. This is the cca 1919 Spyker C1 13'30 Tourer. Bankrupcy 1922 so bought by British Distributors. Finally closed 1926. Another puzzling photo received from Mark Dawber (New Zealand) questioning the make of the vehicle. " I guess it is a big Renault, not a Mack or Kelly-Springfield? -- Indeed a French Renault and after a bit of research defined on a number of websites as a 3.5 ton Model MV, a medium sized lorry. 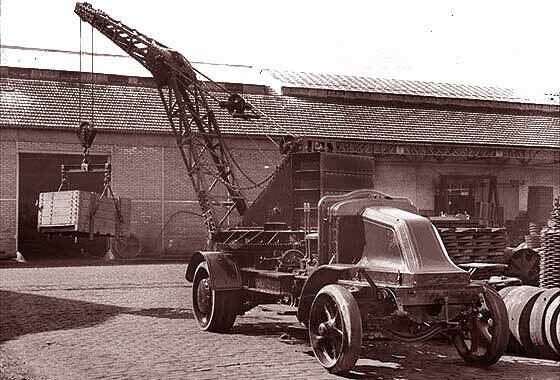 However, we think this is quite a different vehicle, and from the shape of the header tank and specifically shape of the rear wheel hub, this is a cca 1919 Renault Model FU 7 Ton Lorry Crane. Another interesting period photo which was a glass negative from Alun Pugh of Leeds (UK) "Can you give me any details about this Leyland coal truck. Reg [probably] WX 9089...a Batley firm so could be CX or JX. -- Looks CX 9089 to me, Huddersfield CBC. Mid size, longish dumbirons, shortish radiator, and an outline of Layland logo on rad. At that time Leyland used same Cub chassis for lorries and busses. 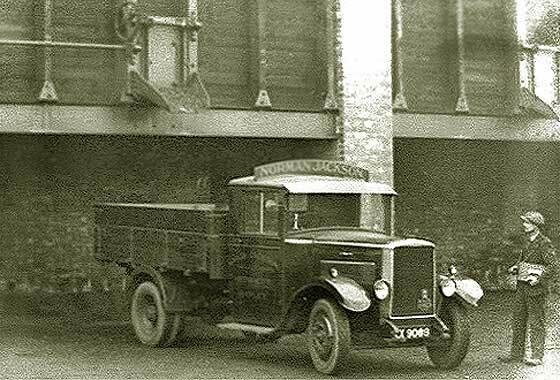 This is a cca 1927 Leyland Cub Dropside Lorry. Made in Kingston, in the ex-Trojan factory. Another patterened period photo which was a glass negative from Alun Pugh of Leeds (UK) " Can you possibly ID this vehicle. Is this a Bradford Jowett?? Halifax plate CP 7166. -- Another badly patterned photo which we have tried hard to improve. Registration CP 7166 is indeed Halifax County Borough Council late 1928. Jowett Cars 1906-53. 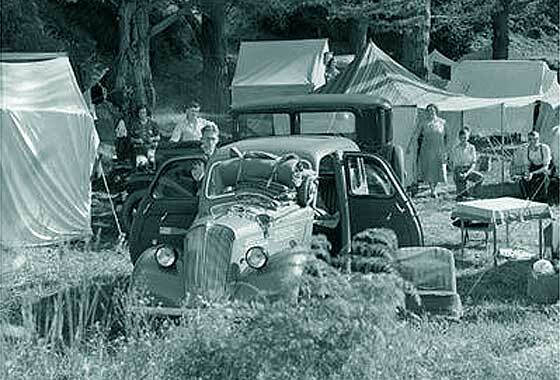 Jowett Bradford was a van made 1946-53. 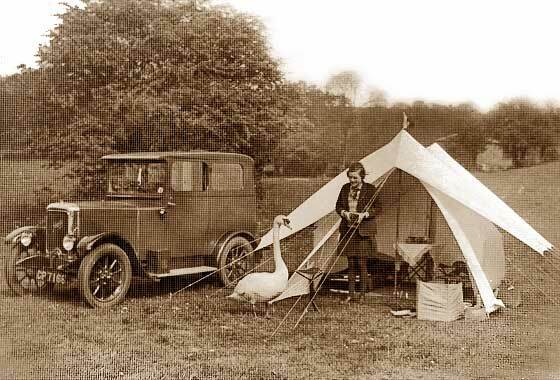 This is a cca 1928 Jowett 7hp Saloon probably a Fabric Salon but not possible to make it out from bad photo. Another interesting photo received from our regular contributor Andrew Kostin, Moscow (Russia) saying" New photo just bought. As well as identifying car, could you please try to ID the country from the registration plate? Back of photo is blank. -- Were hoping to get info on the historic reg from one of our experts but no answer yet. Car is a bit easier having a sign on the badge bar advising it a high spec eight cylinder American, a cca 1933 Nash Ambassador 8 Sedan, Twin Ignition. 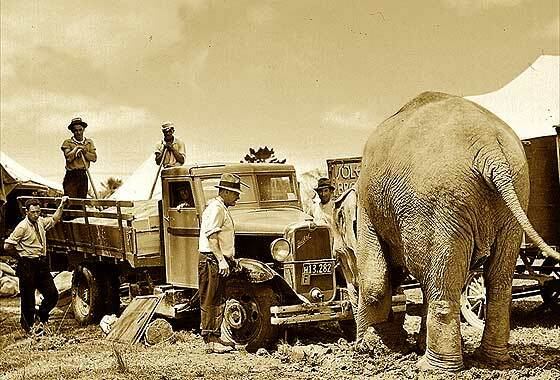 Another rather nice but puzzling photo received from Mark Dawber (New Zealand) of an elephant helping to pull a lorry out of the mud. 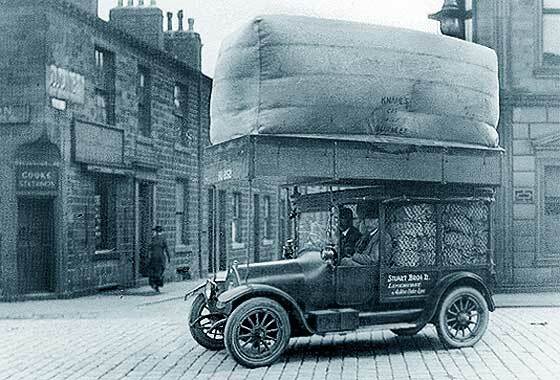 Photo is apparently marked as being 1920s but the truck is a Bedford. -- Scene is at Sole Bros Circus, an Australian organisation touring the Antipodes, started in 1870s. 1926-9 seasons was in South Africa and Congo. Returned Australia 1929. Still operating 1970. Lorry has chrome rad and a cross bar so not 1920s, but cca 1935 Bedford WLG Dropside. Unusual photo received from Victor Brumby, Streatley (UK) archivist for the club 'Europlate' showing his Grandfather's car, a Standard NV 7777, but which model? Can you identify?" -- Indeed a car made by Standard Motor Co of Coventry. The registration is Northampton County Council mid 1936.The identification feature for the year is the molded ends to the louvres saying 1936'7. But there were three sizes of engine in similar body. 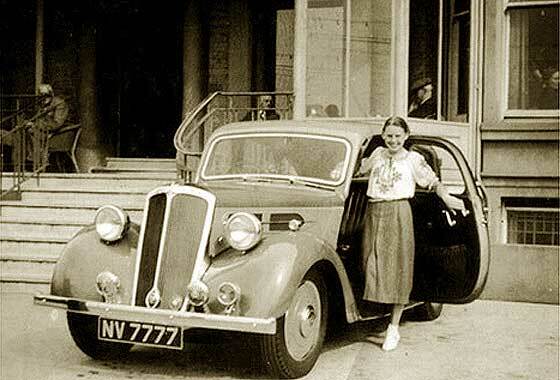 Louvre length suggest c1936 Standard Flying 12 Saloon. Unusual photo received from Victor Brumby, Streatley (UK) archivist for the club 'Europlate', saying he thought a Standard 14/16, but perhaps its a yank? 14 is a Denmark Royal House plate. They usually ran Mercurys 1930s-50s. -- Caught me out. Thought American, possibly 36 Chevrolet, but nothing matched. Our Mark Dawber thought laterally and suggested GM's European offshoot Opel. I was not aware they made a waterfall grille car(!! 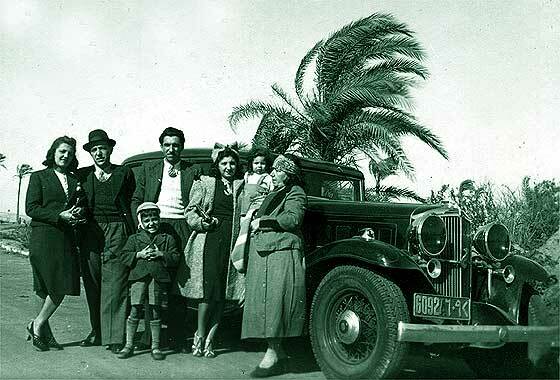 ), but this is indeed c1937 Opel Super Six Saloon. 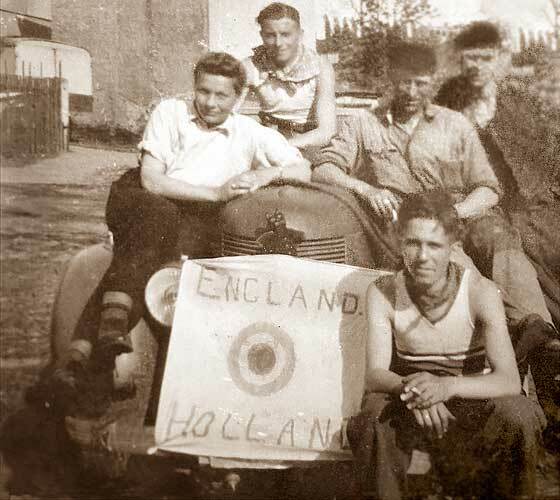 Puzzling period photo received from Maia Adams (UK) "My grandad was prisoner of war in Holland in 1944, and escaped in this car. Not the easiest to identify as is covered. I found a car which looks similar in Amsterdam on Google". -- Indeed very difficult to identify as most of car obscured. Your suggestion Opel Admiral is completely different. Some US-Eurocars had snouty rads. This seems a smallish European car. Best guess French, possibly cca1937 Hotchkiss Amilcar B38 Roadster. Another puzzling photo received from Mark Dawber (New Zealand) probably taken 1950s. Obviously a Flying model but pre or post WW2, and 9, 10 or 12, small aftermarket lamps? -- Standard's Flying range is confusing. Initially had a relatively conventional grille. Seems waterfall grille came in cca 1938. 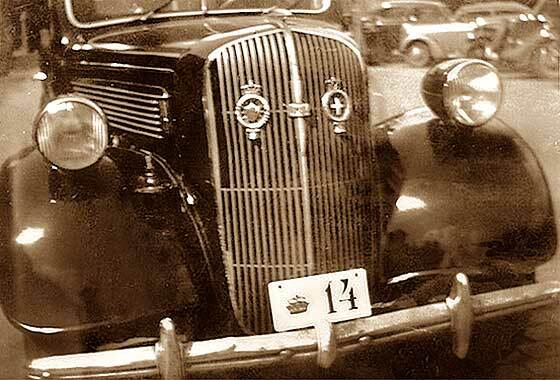 Standard 12 + had chrome edge waterfall grille post war. Three side windows so we think this car is pre-war and as it has smaller headlamps, it is probably a cca 1939 Standard 10 Saloon. Cinema screen grab taken from an Italainmini-series 'Adriano Olivetti: La forza di un sogno' made in 2013, where cars are investigated by IMCDB. Film is about Adriano Olivetti, son of Camillo Olivetti founder of Olivetti empire. Adriano became part of the underground antifascist movement. 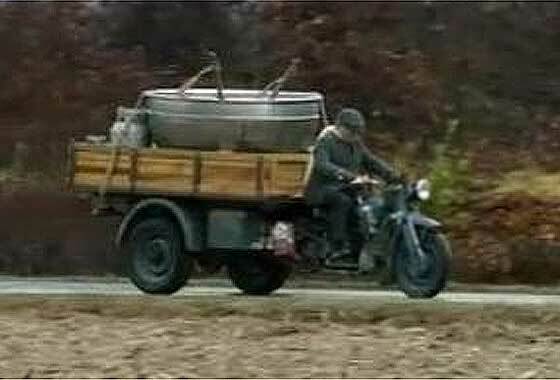 -- This Vehicle was made by oldest continuous European motorcycle manufacturer in Italy, started 1921. This trike was introduced 1948-1980, this being cca 1953 Moto Guzzi Ercole Motocarro. 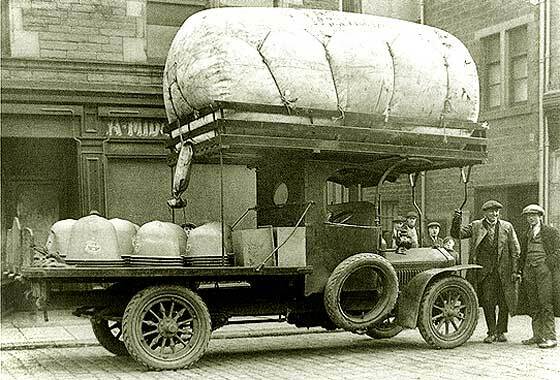 Another interesting period photo which was a glass negative from Alun Pugh of Leeds (UK) " Unusual lorry with gas bag. Can you identify please? -- No registration is visible so not much help in dating or location. Wheels have detachable rims so at this time are likely to be on an American vehicle. Chain drive to the rear wheels. Slope of radiator and header tank shape suggest European. Curved bulkhead suggest British. None of our experts were able to nail it precisely. Help needed ! !